Swimming with Sharks. It lasts only about 4 minutes but a Great White Shark film shot with an underwater super 16 mm film camera has already attracted hundreds of thousands of eyes to www.ocean.com. White Sharks of South Africa was made by Greg Huglin, and shows snorkeller Andre Hartman swimming freely with a super sized shark. Not only is Hartman outside a shark cage, he is also shown being towed through the water by the Great White as he hangs onto his fin. The short ends with the shark attempting to bite the camera’s housing. 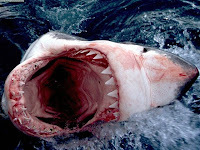 The film was made 6 miles (10km) off the shore of Gansbaa, South Africa.